What Makes A Great Gatlinburg Christmas Cabin Rental? Gatlinburg is an incredible place to visit for a picture perfect Christmas vacation. From the beautiful lights of Winter Magic to festive holiday events, there's no wonder so many visitors flock to the Smokies for a festive winter getaway. Since booking a cabin rental is an excellent way share the Smoky Mountains with friends and family, many guests choose to rent an authentic log cabin for their stay. However, for a holiday as important as Christmas, not just any cabin will do. So we've made a list of qualities that any Gatlinburg Christmas cabin should have to make your yuletide season merry and bright! Use this quick guide while you plan your Christmas cabin vacation in Gatlinburg, TN! First things first, your ideal holiday cabin needs to be available to rent for the dates of your trip. But finding the right cabin for the holidays can be tricky. After all, thousands of visitors flock to the Great Smoky Mountains during this festive time of year. Because competition for cabins can be fiercer than a buying a new Elmo Toy on Black Friday, you'll want to book a cabin as early as possible. However, it's not a simple as finding a cabin during any time in December. For example, reserving a cabin from Christmas to New Years could be an incredible vacation experience, but you would have to book your cabin well in advance to make it happen. Many of the best cabins booked early on, so organizing your cabin vacation sooner rather than later can yield big rewards. The Christmas season is filled with references to snowy weather, cherished holiday traditions, and, of course, fireplaces. While not all of us plan to roast chestnuts on an open fire, there's no doubt we'd all love to sit by a warm fireplace while we open presents on Christmas day! As a result, any proper Gatlinburg Christmas cabin should have a cozy fireplace to make your holiday season warm, inviting, and cozy. Luckily, nearly all of our cabins come equipped with electric, gas, or wood-burning fireplaces for our guests to enjoy. Many of our cabins are fully decorated for Christmas, but not all of them deck the halls for the holidays. Our site makes it easy to find Gatlinburg cabins with decorations by adding a small wreath icon to each property that is decorated for the months of November and December. If you can't find a cabin that there's nothing stopping you from bringing your own Christmas décor to spruce up your cabin during your stay. If you've left all your garland and stockings, you can always find more décor at local holiday shops like the Incredible Christmas Place in nearby Pigeon Forge. TN. 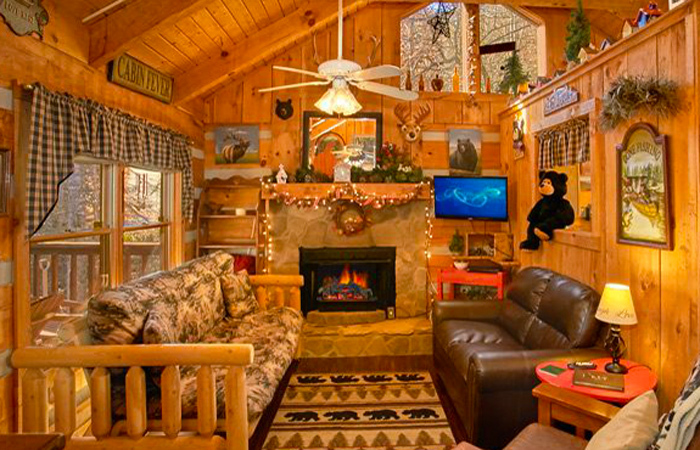 Imagine waking up in your Gatlinburg Christmas cabin to a lovely view of snow-capped mountains in the distance. Gatlinburg is an excellent place to enjoy scenic views year-round, but Christmas is an especially lovely time to see the mountains. Cold winter weather often leaves the tall peaks in the national park with a coating of pure snow and ice. Sometimes this is simply rime ice, but other times, the mountains have received several inches of snowfall. While Gatlinburg itself doesn't receive a lot of snow in December, the tall peaks in the Smokies usually get plenty of the white stuff. For this reason, booking a cabin with a mountain view is one of the best ways to see the beauty of a Smoky Mountain winter. It's a Wonderful Life, A Christmas Carol, A Charlie Brown Christmas, and many more classic movies are a huge part of our holiday celebrations. While these nostalgic classics are always a pleasure to watch, you can take your enjoyment to the next level by reserving a log cabin with a theater room. Our cabins with home theater systems boast comfortable theater-style seats, projector screens, and surround sound create a quality viewing experience that the whole family is bound to love! 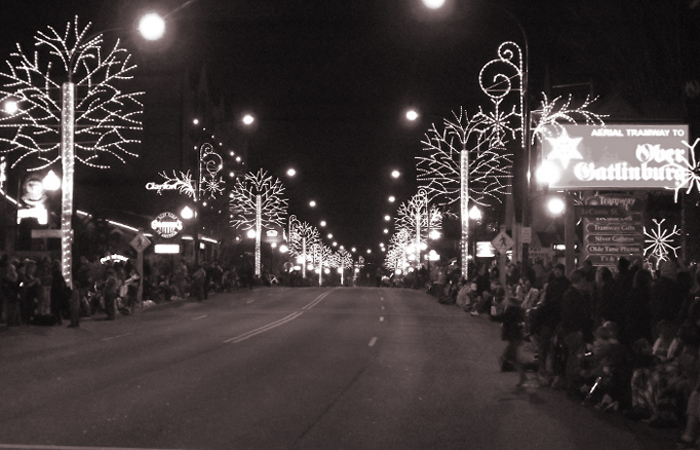 One of the best parts of spending Christmas in Gatlinburg has to be all the wonderful events and attractions. From the Fantasy of Lights Christmas Parade to the holiday magic of Dollywood in December, staying near fun yuletide events and attractions is a must! There are tons of fun things to do in Gatlinburg for Christmas, so be sure to reserve a cabin that's convenient to the region's best attractions. Luckily for our guests, many of our rentals are only a short drive from top local attractions like Downtown Gatlinburg, Ober Ski Mountain, and the national park. In reality, the holidays can be an expensive time of year. Travel, food, and Christmas shopping costs can really take a chunk out of your budget during the most wonderful time of the year. While we could just ask Santa for more money for the holidays, it's also possible to find great cabins for Christmas with special discounts! In fact, all of Cabins USA Gatlinburg's cabins come with a 15% discount to help you save money on your vacation! Booking the right cabin to spend the holiday with your family is important for enjoying this festive season to the fullest! For help finding the right cabin for your getaway, call our office at (865) 436-5031. You can also search our website for cabins with a festive Christmas wreath icon, so that you know it will be decorated for the holidays! Have you ever spent Christmas in a Gatlinburg cabin? What was your favorite part about your holiday vacation? We'd love to hear your stories in our comments section. Book My Gatlinburg Christmas Cabin!